Amy's Robot: Oh my god! The Help Can Read! Oh my god! The Help Can Read! At a recent personnel committee meeting of our West Side co-op, the building’s super and the committee members were discussing whether an employee should be suspended for an apparent lie he had told about a misplaced package. Knowing this employee quite well, I mentioned to the super that I did not think a suspension was necessary, since this employee had a very harsh superego and he had suffered enough with his own guilt over the weekend. A day later, I ran into the super in the lobby and he greeted me with a hug and a huge smile. He told me he was eager to begin reading Freud and discussing the id, ego and superego with me. We don't find it all that surprising that the super is intelligent, and has interests outside of his job. To counteract Ms. Fay-Bergman's condescending attitude, please enjoy this picture of SEIU 32 BJ's Superintendent of the Year Charles Brown. 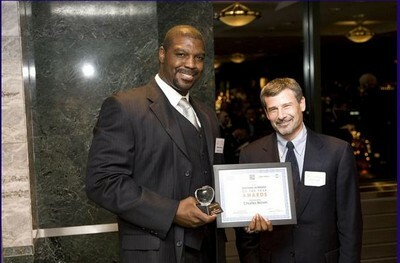 Superintendent of the year Charles Brown and Paul Gottsegen, Director of Management at Halstead Management, 2007 Building Service Workers of the Year Awards, 32 BJ. After cleaning the vomit off my keyboard and monitor, I reread this post and it answered a long-held question of mine: whether anyone who didn't live on the Upper East Side of Manhattan still believed in Freudian psychology. Despite generations of progress in neuroscience and experimental psychology that have thoroughly discredit Freudian psychology, the ecological niche of this peculiarly nonsensical brand of Victorian pseudoscience apparently extends all the way to the Hudson.